Brilliant image quality requires high colour brightness (colour light output), and Epson� 3LCD projectors have 3x Brighter Colours than leading competitive projectors*. One brightness measurement (lumens) is not enough. A projector's specification needs to show both high colour brightness and high white brightness. If colour brightness is lower than white brightness, images may be dark, dull and lose detail. Be sure to ask for a projector's colour brightness specification. All Epson projectors are based on 3-chip LCD technology for amazing colour, incredible detail and solid reliability. 3LCD 3-chip architecture dedicates an entire chip to process each primary colour ? red, green and blue, continuously. Unlike single-chip technology that delivers colour sequentially, you get full-time colour. The result is vibrant, realistic images and video all delivered with 3LCD's true-to-life colour. For the best quality images, look for projectors where the colour brightness and white brightness are equal. If colour brightness is lower than white brightness, photos, videos and graphics can look dull and washed out. The Epson EH-TW6700W delivers 3,000 Lumens of colour brightness and 3,000 Lumens of white brightness (light output) for rich, colourful images. Enjoy thrilling 3D adventures right in the comfort of your living room. Featuring Bright 3D Drive technology, the TW6700W puts you right in the middle of the action. Epson's drive system minimises the blackout time of 3D glasses and provides greater brightness when viewing 3D content. Transform any 2D movie, from the latest science-fiction adventure to your favourite classic, into spectacular 3D or watch the big game in exciting 3D. The TW6700W makes it easier than ever with convenient 2D-to-3D conversion. With just the touch of a button, you can watch your favourite shows and movies in eye-popping 3D. With no special discs required the possibilities are endless. The EPSON Wireless HD? 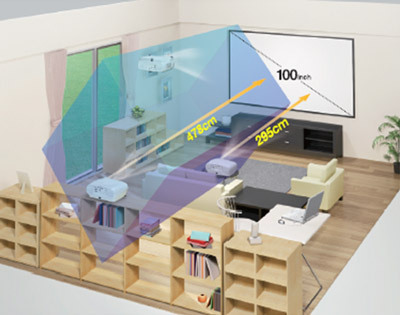 streams reliable, Full HD 1080p, 60 Hz video from your devices to the projector, within the same room, at a distance of up to 10m, with stellar Full HD 1080p image quality. The system is HDCP compliant and can stream copy-protected content. Its fast signal transfer ensures real-time transmission of HD media without buffering or drop out. The wireless transmitter provides a secure connection that resists interference with nearby wireless routers. Setup your A/V equipment once, connecting to both your projector and a second display device such as a TV. Whether you want to view content on your projector or your second device, you no longer need to unplug and re-plug in your devices. 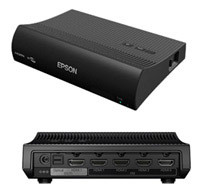 All you need to do is connect both devices to the EPSON wireless HD? transmitter and then choose which display device you'd like to use.